Wallabies coach Robbie Deans was quick to admit his side had been beaten by a better team in the wake of their shock 32-23 loss to Samoa in Sydney. Tries from winger Alesana Tuilagi, fullback Paul Williams, lock Kane Thompson and centre George Pisi propelled Samoa to their first-ever victory over Australia and avenge 74-7 mauling in their last meeting at the same venue six years ago. Winger Digby Ioane and No.10 Matt Giteau crossed for the hosts but the world's No.2 ranked side could have no complaints about the result. "We weren't good enough at what we did," said Deans who went on to defend his decision to rest a host of front line stars for the game including many of those players that inspired the Reds to Super Rugby glory last weekend. "They're a good combination, it was a globally selected side, it's a World Cup squad, where we're at, we're just stating we knew that. I think the injection late in the game showed what we could have done but it was too late." Deans has little time to dwell on the embarrassing defeat with South Africa awaiting them this weekend in the opening clash of this year's Tri-Nations. "It's a game that I'll remember," added Deans. "Obviously, we won't focus on individuals at this stage but for blokes that get the call again they've had a good learning experience. "Some of the Reds who didn't come back into the squad until Monday will come back into contention but in regards to the injured players not much will change there, we'll just have to wait and see, we've got six days until we face the Springboks." Wallabies captain Rocky Elsom, making only his second appearance of the year, is determined to lead the fightback against the Springboks. "I'm not happy about it, I don't think anyone is, but we've got six days till will play the Springboks so we've got plenty to work on," he said. "I think the thing that let us down was that we weren't effective enough in attack. They put on good shots and they deserved to win but we weren't effective enough in attack. I think the island sides are better when they get their full complement back and I think they'd be happy to have all their players all the time." Samoa coach Fuimaono Titimaea Tafua hailed his side's achievement, commenting: "It's history for us to beat the number two side in the world," with his assistant Brian McLean adding: "Today for us was about getting some respect and hopefully we got some." 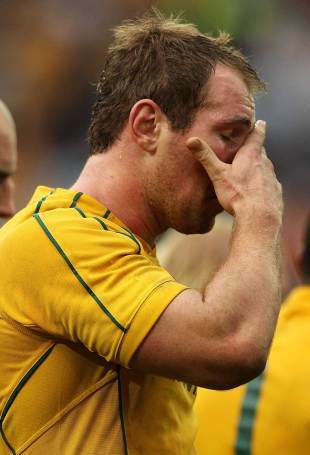 An emotional Samoa skipper Mahonri Schwalger said: "I'm lost for words. We kept at them for the whole 80 minutes and never gave them a chance. It's something special for us and to help create a future for Samoan rugby." His sentiments were echoed by centre Seilala Mapusua who said: "It's amazing what adrenalin can do. In the end, the guys were out on their feet. But that's the nature of our team that players are willing to die for the jersey. "I can only imagine what's going on in the little island a few hours from here. We've always believed as a team that Manu Samoa belongs to the Samoan people, so we're always playing for our people every time we pull on that blue jersey. Words can't express the support we felt. Just seeing all the people waiting around at the end there, it's huge." Samoa, who are in the same Rugby World Cup pool as defending champions South Africa and Wales, could well meet Australia in the knockout stages in New Zealand in September-October. "That's our aim," McLean said. "Our goal is to make the quarter-finals and, the way things are set up, if we finish second in our pool and Australia wins their pool, then we would meet them in Wellington in a quarter-final. "We had quite a good tour of the northern hemisphere last year and this was our first game where we've had all our players back. Now we're just hoping to grow our game and today for us was about respect. We wanted to get some respect and hopefully we've done that."